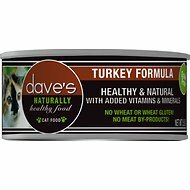 Give your kitty the nutrition he needs to thrive with Dave's Pet Food Naturally Healthy Grain-Free Gobbleicious Gourmet Dinner Canned Cat Food. The formula provides plenty of protein to fuel all those adventures, with protein-rich turkey and chicken as the top ingredients. Every juicy bite is loaded with wholesome omegas for a lustrous coat, plus vitamins, minerals and essential taurine to help your pal look and feel his best. With no grains, wheat or anything artificial, even kitties with sensitivities can dive into their bowl. 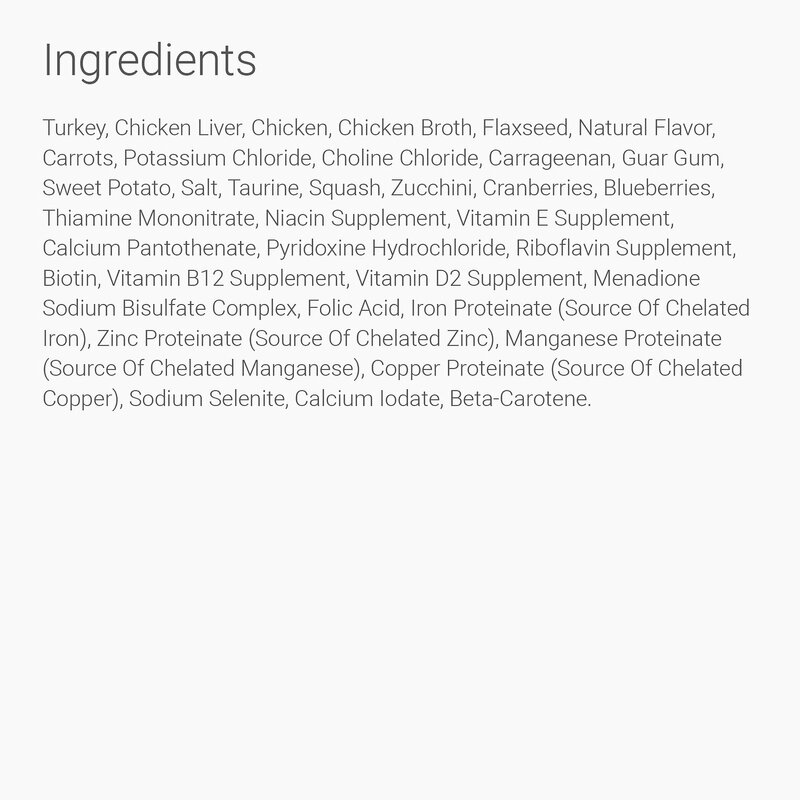 Turkey, Chicken Liver, Chicken, Chicken Broth, Flaxseed, Natural Flavor, Carrots, Potassium Chloride, Choline Chloride, Carrageenan, Guar Gum, Sweet Potato, Salt, Taurine, Squash, Zucchini, Cranberries, Blueberries, Thiamine Mononitrate, Niacin Supplement, Vitamin E Supplement, Calcium Pantothenate, Pyridoxine Hydrochloride, Riboflavin Supplement, Biotin, Vitamin B12 Supplement, Vitamin D2 Supplement, Menadione Sodium Bisulfate Complex, Folic Acid, Iron Proteinate (Source of Chelated Iron), Zinc Proteinate (Source of Chelated Zinc), Manganese Proteinate (Source of Chelated Manganese), Copper Proteinate (Source of Chelated Copper), Sodium Selenite, Calcium Iodate, Beta-Carotene. I have only 2 brands I feed my cats and this is one of them. Before Dave's, one of my cats had frequent loose stools and vomited a lot. No problem with either now that we switched foods, and it has been over a year with no spot cleaning to my carpet anymore! We buy only chicken or turkey. 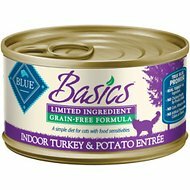 My cats will not eat this food. All 5 say "nope not gonna try that stuff".I gave it one star since my dogs enjoy it and take their pills easily tucked inside a wad of this stuff. Going back to Fancy Feast because they always eat it. My two finicky cats have always eaten this food when I would buy it at the speciality pet food store near me. But I thought I’d save me some time and buy it through chewy... well, needless to say, they only eat half of it and the rest sits around and doesn’t get eaten. There was never that isssue before. So I’m not sure if the recipe is different or what, but I’ll be returning to the pet food store from now on to buy this food. My cats are fussy (typical cats) and have tried almost all the pricey brands with mixed results but this brand (pate) is consistently eaten! And the price makes me happy. Dave's has ingredients comparable to many other high-end brands at a fraction of the cost. I love that it is all natural, grain free, and contains whole protein sources instead of meat-by-products. I save almost $30 a month by feeding Dave's over other similar brands. The Gobbelicious Gourmet Dinner is my cat's favorite. She used to eat most wet food, but since I started giving her this she looks at me with disappointment whenever I try to mix things up with a different flavor or different brand. Overall, a really great option if you are looking for a high-quality food that won't break the bank. one day they love it, the next time they "cover" it up! Yes, all of them, all 4 cats, even the ones that say "do we have anything else in the house?" They all like it, eat it happily, and they like it for longer than one or two days. Decent ingredients, reasonable price. My 12 year old cat loves this food! The ingredients look good and he gobbles it right down. He has not been on it very long, so we will see how it affects him long term. The price on this food is very reasonable too, as we were feeding him Wellness. My cats like this food and I like that it is healthy for them. 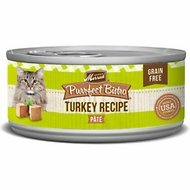 My female cat doesn't vomit after she eats this like she does after eating most other foods, and she really likes the taste. My boy will eat it, but he does prefer it mixed with Tiki cat shredded chicken and egg. The price on this food is very reasonable and helps keep the cost of feeding both cats down. My cat eats it with no problems, and its so moist.